- The term "User" means any visitor and/or user of the Site. The various sections of the Site are managed by producing company or by possible third parties specified each time expressly. This agreement contains the terms and conditions relating to the use of the Site, including the terms and conditions governing responsibility. BY ACCESSING ANY PART OR SECTION OF THE SITE, THE USER ACCEPTS THE TERMS AND CONDITIONS HEREIN AND UNDERTAKES TO ABIDE BY THEM. SHOULD THE USER NOT AGREE WITH ANY OF THE CONDITIONS SPECIFIED IN THIS AGREEMENT, DO NOT USE THE SITE. Private property notice - Downloads. Users acknowledge that the information, data, software, photographs, graphs, videos, graphics, music, sound, images, illustrations, designs, icons and any other material present on this Site, unless otherwise specified, are the exclusive property of the producing company. Duplication, reproduction - even partial -, downloading, saving, publishing or dissemination with any means and more generally any act of disposal or use of information or material taken from this Site, in all forms, using existing media and technology or those developed in future, is strictly forbidden, barring the right to download a single copy of the contents specified as available for download in a single computer for personal use and for non-commercial purposes, provided the recognition of the author and the other credits referring to copyrights and property rights remain intact. Any software downloaded from the Site, as well as the files and images contained therein or created thereby and the data accompanying such software are granted under license by the producing company, without this licence implying the transfer to the User by producing company of the ownership of rights on such software. Users have possession of the material media on which such software is installed, but ownership of the software and the intellectual property rights remain those of the producing company and/or any third parties. Users are forbidden from distributing, selling, taking apart, breaking down, disassembling or otherwise translating the software in a format comprehensible to man. 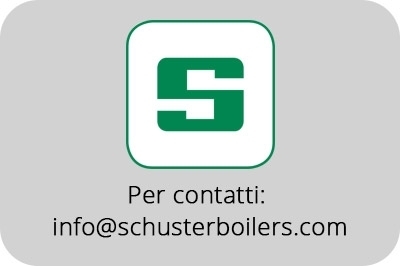 The site www.schusterboilers.com is the exclusive property of the producing company, that has created it for giving information with commercial purposes. "Schuster" is a logo and registered trademark owned by the producing company, as are all the logos used in the Site and registered as producing company trademarks. The trademarks and logos of third parties present on the Site are the exclusive property of their respective owners. The use or reproduction in any form and way of such trademarks and logos is forbidden. Permitted use of the Site. Users may use the Site solely for legitimate activities and shall not use the Site for any speculative or fraudulent use. It is expressly forbidden to use any part or section of the Site, the information or material present on the Site for commercial or advertising activities of any sort, barring express written authorisation to do so by producing company. Any Users found to commit fraudulent or illegal acts will be prosecuted in accordance with the law. The Site can be accessed by users from anywhere in the world and the Site may contain references to products and services that may not be available in the User's country of residence. The existence of such references does not imply that the producing company intends to make such products available in the User's country. The producing company reserves the right to not make certain products available without prior notice, or to modify their characteristics at any time and without any notice or obligation. The producing company denies all responsibility in the event of printing or transcription errors. The producing company also reserves the right to make any changes to its products that it deems necessary or useful without adversely affecting their essential characteristics. The information made available on the Site may contain inaccuracies or errors. The information contained in the Site is subject to periodic changes. The producing company and/or its respective suppliers may make improvements and/or changes to the Site at any time. The producing company and/or its respective suppliers do not issue any guarantee or declaration relating to the appropriateness, reliability, availability, freedom from viruses or other components which may cause damage, accuracy of information, of services and of the related graphics contained in the Site. Under no circumstances may the producing company and/or its suppliers be held responsible for direct, indirect, moral, accidental, special or consequential damage or for damage of any type, including, by way of example, damage for loss of use, data or profit ensuing from, or in some way linked to the use or the performance of the Site, the delay in using or the inability to use the Site. Under no circumstances may the producing company and its directors, employees or collaborators be responsible for any injury, loss, request, damage, whether direct or indirect of any kind, even if ensuing from a contract or from a civil illicit act, or in any way connected with the use of the Site that does not comply with the terms and conditions, even if the producing company has been informed of the possibility of such damage. If, despite the above, the producing company should be deemed responsible for damage or loss relating to the use of the Site, the User accepts and acknowledges that the responsibility of the producing company cannot under any circumstances exceed the cost (where present) incurred by the User to use the Site. CONNECTION FROM OTHER SITES TO THIS SITE USING HYPERLINKS TO THE HOME PAGE MAY BE MADE UPON REQUEST SENT TO THE PRODUCING COMPANY. THE PRODUCING COMPANY RESERVES THE RIGHT TO REFUSE TO GRANT AUTHORISATION FOR LINKS SHOULD SUCH A LINK CONSTITUTE IN SOME WAY DAMAGE OF ANY KIND TO THE PRODUCING COMPANY (INCLUDING DAMAGE TO ITS IMAGE AND GOOD NAME), AT ITS SOLE DISCRETION. HYPERLINKS REFERRED TO AS DEEP LINKS OR WITH TECHNIQUES AIMED AT PREVENTING RECOGNITION OF (OR MASKING OF) THE PROPERTY OF CONTENTS (FRAMING) ARE EXPRESSLY FORBIDDEN. The producing company has the utmost respect for its Users' privacy. The data disclosed by the User to the producing company through the Site shall be processed with the utmost care and using all the tools devised to guarantee security thereof, in compliance with the applicable Italian regulations in force on the subject of privacy protection. Please read the attached disclosure on this subject. Following suitably motivated requests made in writing or by e-mail, the producing company undertakes to remove quickly any material present on the Site found to be the property of individuals other than the individual specified as the author of the material or editor of the section of the Site, who may legitimately lay a claim to any right or interest on the material itself or on its contents, or in the event that the material or its content compromises any interest or right protected by the law. For any reports, claims or information relating to the Site, Users can contact us by using the form on the CONTACT US page or by writing to: info@schusterboilers.com. THE PRODUCING COMPANY MAY TERMINATE OR SUSPEND THE USER'S ACCESS TO ALL OR PART OF THIS SITE AT ANY TIME, WITHOUT WARNING, AND AT ITS SOLE DISCRETION. The terms and conditions herein comprise the entire agreement between the User and the producing company in regard to the use of the Site and they replace any previous agreement or declaration. THE PRODUCING COMPANY RESERVES THE RIGHT, AT ITS SOLE DISCRETION, TO AMEND THE TERMS AND CONDITIONS HEREIN, DISCLOSING THE NEW TERMS AND CONDITIONS ON THE SITE. THE NEW TERMS AND CONDITIONS SHALL BE VALID AND EFFECTIVE FROM THE MOMENT THEY ARE PUBLISHED ON THE SITE. THE USE OF THE SITE BY THE USER SHALL BE SUBJECT TO THE TERMS AND CONDITIONS PUBLISHED ON THE SITE AT THE TIME OF USE. Applicable law and court with jurisdiction. THE TERMS AND CONDITIONS HEREIN SHALL BE GOVERNED AND INTERPRETED UNDER THE ITALIAN LAWS. The Court of Mantua, Italy, shall have sole jurisdiction over any dispute arising from the terms and conditions herein. Any and all matters not expressly dealt with herein shall be governed by the applicable provisions of the Italian laws.